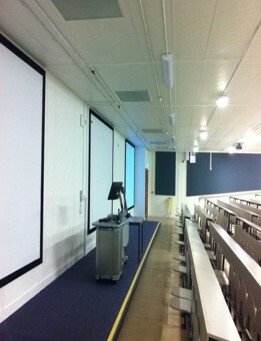 Queens University appointed Extraspace Solutions to deliver and install two lecture theatres and a 150 person computer suite, on a very restricted site on Campus in Belfast. The facility, which is a rental for a two year period, will provide space, while the renovation of existing lecture and study facilities is undertaken. •1 No. 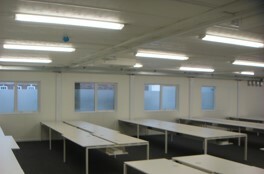 150 Person Computer Suite. •Full A/C / Electrics etc. Site Restrictions and College Timetables had a considerable influence on the requirement for detailed Project Programmes being developed and managed to ensure timely delivery, without Student disruption.